In my previous tutorial I showed you guys “How to Install ownCloud 10 on Raspberry pi 3 with Raspbian Stretch Installed” and in that same tutorial I showed how to mount an external hard drive for additional storage capacity. In this tutorial I’ll be showing you how to back up the Raspberry PI owncloud default directory in case you didn’t mount an external drive, and or the “external hard drive” in case you mounted one for Raspberry PI ownCloud. If you followed my tutorial then the default directory of owncloud would be “/var/www/html/owncloud“. If you mounted an external hard drive then the default directory would be “/media/ownclouddrive“. Note: This type backup is to backup what matters most which is your data, nothing else. I’ll be showing you how to back up to an external hard drive. So we would need to mount a hard drive to a new directory. Plug in the Backup external hard drive to the RPI. These instructions are for mounting an NTFS formatted hard drive and allowing the Raspberry PI ownCloud to store files onto it. 7. Also we meed to get the UUID of the attached external hard drive so the RPI can remember this drive even if you plug it into a different USB port. 10. Add the following line to the bottom of the file, updating uid, guid and the UUID with the values we got above. (It should all be a single line). Dont forget to replace the UUID number in blue to yours in stead of the one you copied from here. To create a back up you need to install “rsync” this will allow us to sync the directories creating a backup of it. 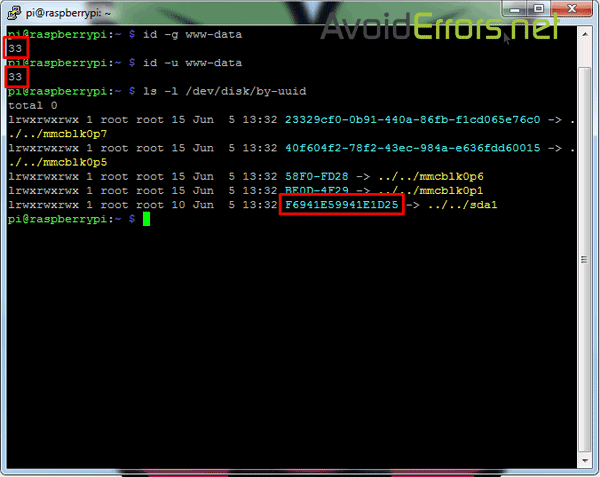 This code above will synchronize the contents of Directory1 to Directory2, and leave no differences between the two. This tells us that we are syncing the owncloud directory to the backup directory which is mounted to the external hard drive. In case something goes wrong you can always plug that external drive to a PC and have access to your files and photos. 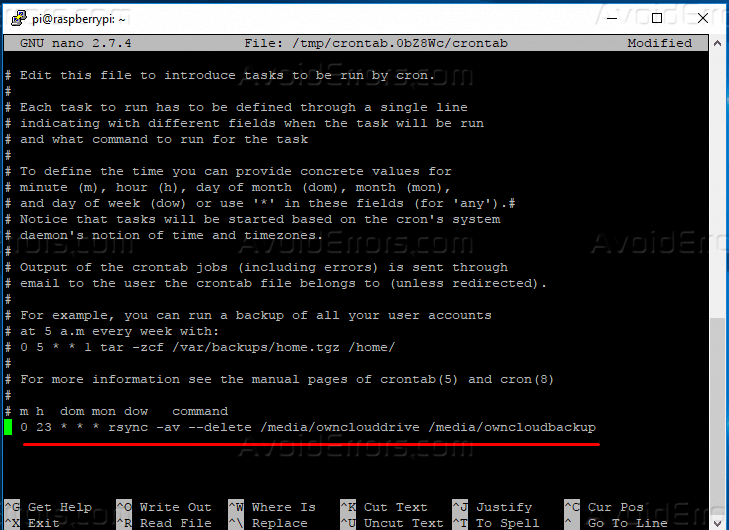 With Cron, we can have our Raspberry pi owncloud system run scheduled backups however often you would like them to run. Here select option 2 and hit Enter to open the Crontab. The following line will run the “rsync” every night at 11 PM. Don’t forget to replace /Directory1/ /Directory2/ with the proper Directories. This type backup is to backup what matters most which is your data, nothing else. If you have any question please place it in the comment section below.